The Monastery of St. John is a community of Christian men striving to follow the Gospel of Jesus Christ, working out our salvation in discipleship to Christ in the Orthodox Church. We embrace the evangelical ideals of poverty, chastity, obedience and stability. We strive for unity of mind and heart with one another in a communion of love, having all things in common and living a shared life of work and prayer. The Monastery of St. John of Shanghai and San Francisco was founded in 1996 as a community of Orthodox Christian monks. Currently the brotherhood consists of about twelve monks and novices. We are located on 42 acres of scenic Ponderosa forest near the town of Manton, California, in the foothills of the Cascade Mountains near Mt. Lassen National Park. Manton is less than an hour’s drive from both Red Bluff and Redding. 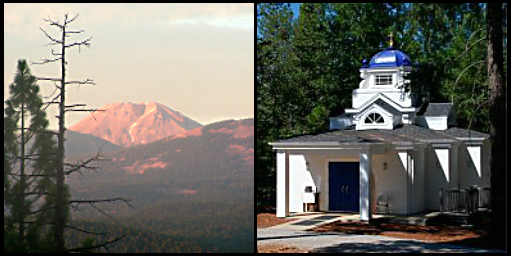 The brotherhood was originally located at Point Reyes Station, California, at St. Eugene’s Hermitage, a small facility which belonged to the Diocese of the West of the Orthodox Church in America, where there had been a monastic presence for over 50 years. Our monastery continues to be a part of the OCA Diocese of the West. Due to growth in numbers and industries, the Monastery moved northwards to Manton in the summer of 2006. The brotherhood seeks to live the traditional communal Orthodox monastic life as established by St. Pachomius and St. Basil in the fourth century, and as guided by the teachings and examples of subsequent Holy Fathers. We are informed and inspired by the living tradition of the ancient monastic centers, including those of Mt. Athos in Greece and Valaam in Russia. Along with these two monastic centers, we worship according to the Julian calendar, which is currently thirteen days behind the civil calendar; however, we do not make this a dogmatic issue. We struggle to be faithful to holy tradition while adapting to the realities of contemporary America. Most of the brothers are Americans, and the services are conducted in English. The aim of our life is simple obedience to the commandments of Christ and the Holy Scriptures. We strive to earn our living by making candles, publishing, woodworking, and operating a bookstore. We also grow some of our own food.